An age gap between lovers can make for incredible drama as the couple step outside preconceived notions of what is deemed socially acceptable in a relationship. The seminal film The Graduate (1967) is the most prominent in this regard which, while comical, also conveyed the ideological differences between generations. In Korea such themes have also played out, most notably in Kim Ki-young’s exemplary 1960 classic The Housemaid (하녀), while more contemporary offerings have arrived in the form of Kim Ki-duk’s The Bow (활) and Yang Ik-joon’s Breathless (똥파리). While each film approaches the subject differently they all exhibit the conflict that arises between youth and maturity, attraction and repulsion, desire versus social acceptance. A Muse (은교), directed by Jeong Ji-woo (정지우), provides a gently poetic, emotionally fraught, and symbolic take on the romantic theme, in keeping with his back-catalogue. The exploration of the relationship between the three central protagonists contains poignant depth, bolstered through an interrogation regarding the nature of age and talent. However, the film is also somewhat hampered by the casting of Park Hae-il as an old man, while the constant fetishization of Eun-gyo’s body – rather than her mind and spirit – undermines the purity of their relationship. As a poet and national icon, elderly Lee Jeok-yo (이적요, Park Hae-il (박해일) has enjoyed incredible success, even preparing for a museum to be constructed in his honor. Yet now is the time for his young apprentice Seo Ji-woo (서지우, Kim Moo-yeol (김무열) to shine as his new novel becomes an incredibly popular and rapid bestseller. However their lives, and their relationships, are drastically altered when a young girl named Han Eun-gyo (한은교, Kim Go-eun (김고은) visits their home, charming them both with her youthful vitality and curiosity. While A Muse (은교) takes quite some time in establishing the life of poet Jeok-yo and that of his student Ji-woo, the inception of Eun-gyo – also the name of the original Korean title – distinctly elevates the film and gives it direction and purpose. Director Jeong Ji-woo (정지우) does an incredible job of constructing Eun-gyo as an intoxicating protagonist, a young woman whose youth, energy and curiosity are infectious and spellbinding. However, the most prominent form in conveying such devotion is through the fetishization of her body, featuring close-ups of her skin and various body parts, sexualizing Eun-gyo to the point of worship. With the knowledge that Park Hae-il portrays the elderly poet, such scenes are (despite the misogyny) tender and romantically sexual, yet had an actor of the correct age performed the role perversity would undoubtedly enter critical debate. Luckily Jeong Ji-woo also emphasizes the emotional and spiritual connections between the two, and that Jeok-yo desires Eun-gyo’s youth, purity and innocence as much as her physique, as she is in turn attracted to his depth of character and devotion. Age may suggest otherwise but they are kindred spirits, and sequences in which they strengthen their bond are heartwarming and endearing, particularly during the soft-focus scenes where Jeok-yo imagines himself as a young man. Their relationship is in stark contrast to those involved with Ji-woo, who worships Jeok-yo as a respected surrogate father and idolizes Eun-gyo due to their similar ages and as someone who can heal his loneliness. The director is highly intelligent in constructing each relationship as distinctly different entities, evolving each subtly and with realism as jealousy and desire intermingle with love and affection. However as Ji-woo is certainly the less developed of the three he perhaps unfairly falls into a villainous category, rather than a conflicted young man. Romance and personal connections inform the exploration of age within A Muse (은교) ,which is arguably the central concern of the narrative. The depth, symbolism and subtlety are eloquently conveyed as each protagonist gradually reveals their shortcomings seemingly ascribed through age. Jeok-yo, having lost his youth, uses Ji-woo and Eun-gyo as agencies through which to live again, contrasted with Ji-woo’s competitive masculine nature and Eun-gyo’s innocence and curiosity. What is fascinating throughout the narrative are the ways in which each protagonist views things differently and the ways in which they display emotion and respect, allowing audiences to genuinely understand them and their motivations. As such, when the film ends, the tragic fallacies and the impact of events linger and resonate long, long after the final credits. Kim Go-eun (김고은) gives the stand out performance within A Muse (은교) as high schooler Eun-gyo and is enthralling. The actress inhabits the role completely, conveying innocence, curiosity and vitality with genuine charisma forcing audiences to adore her as much as the protagonists do. Kim Go-eun’s charismatic performance is such that it is easy to forget her age and occupation, drawing spectators in with her enthusiasm and smile whilst also sympathizing with her as the unwitting catalyst in a love triangle. Passionate scenes are also sincere, and while the constant fetishization of her body occasionally undermines her character Kim Go-eun utilizes her physicality to convey a range of emotions depending on who she is with. 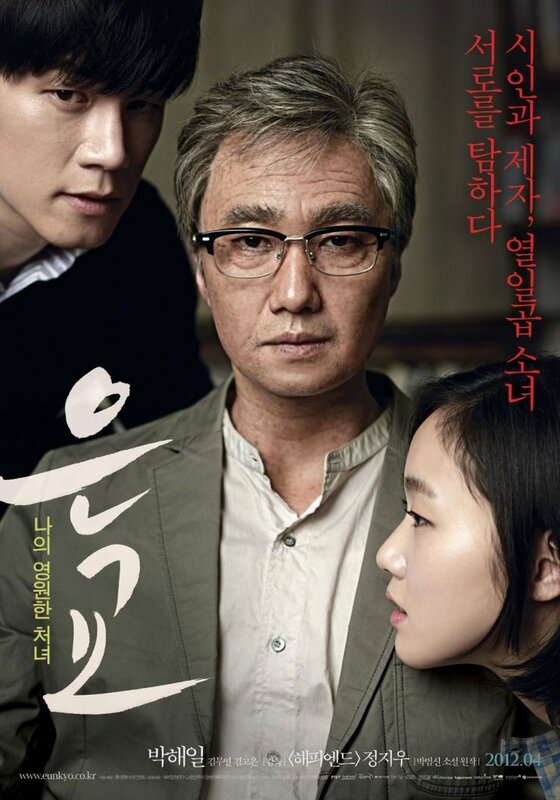 As always Park Hae-il (박해일) gives a highly competent performance as elderly poet Jeok-yo. His casting is odd but understandable given the sexual scenes and fetishization of his love interest’s body, but it is difficult not to think that an older actor would have lent more credibility to the role. There are certainly a lot of actors of this age group in Korea that are incredibly talented, as Lee Chang-dong’s sublime Poetry, and Choo Chang-min’s Late Blossom, highlighted. In any case, Park Hae-il portrays the stoicism and loneliness of Jeok-yo well, conveying the evolution of the character subtly and organically. However there are several occasions where the actor is clearly trying to act like a senior citizen to the detriment of the scene, distractions in an otherwise competent display. Kim Moo-yeol (김무열), despite receiving the least amount of screen time, portrays the role of jealous young author Ji-woo competently. The driven and arrogant nature of the character is performed well, as is his complete lack of understanding in regards to the depth of both Jeok-yo and Eun-gyo. Ji-woo’s love/hate relationship with them both is also interesting to watch unfold and is never contrived, resulting in a slow build of tension just waiting to erupt. A film of great depth and symbolism, A Muse (은교) is an eloquent exploration of the nature of age, love, and relationships. While the fetishization of Eun-gyo’s body tends to undermine the spiritual connection between her and Jeok-yo, with Park Hae-il’s casting simultaneously helping to alleviate the sexualization as well as being an oddity, the film succeeds on the strengths of a wonderfully character driven narrative and a superb debut by actress Kim Go-eun. With the subtle, organic and romantic performances and directorial style, the themes explored within A Muse (은교) will undoubtedly resonate with audiences long after the finale.